May the blessing of the Lord be rich in your lives as we move into this year! My first message to you this year is to emphasize the heart of this message that we understand as the Gospel – the love of God our life, nourishment, empowerment to live – has come to us and into us from the Father in Jesus through the Holy Spirit dwelling in us. This is the mystery of the divine love walking our streets and workplaces in us today. But my emphasis is on our self-speak – how we address our deepest self about our self… listen to find out! There are a number of exciting things happening this year – and more that we do not know about yet! – I am sure at least one of them can involve you. We will be in St. Petersburg, Florida in June 7-8, 2019 Registration for the retreat is $350 per person and will be at the Crystal Bay Resort (7401 Central Avenue St. Petersburg, Florida). To book your room with the hotel and meals, call (727) 914-7676 and let them know you are booking for the Unconditional Love Retreat. Our group rate for the rooms is $90/night and $35/day for meals. The space is limited so please call the office right away to secure a spot. We are expecting a number to come from the East Coast for this event – but of course it is open to all. The retreat is “Living in the Fullness of God” – it is a retreat that will open your eyes even wider to this incredible life that we are called to in Christ. We are limited in space so call the office or register online at www.unclov.org today. We will be finishing the present Bible School cycle with Module 7 on April 5-6, 2019 with graduation at the Drury Inn & Suites San Antonio Near La Cantera Pkwy (map). All students be sure to make this school. We are commencing a new cycle of modules April 26-27, 2019. The first module is different to our usual Module 1; it is titled “Union with the Triune God”. It will be complete in itself showing the message of the entire Bible is union with the Trinity. It will make it easier to understand all the modules that follow. We have had many who have said that they want to be at this Bible school – please contact the office at once so that we can determine the venue. Thank you for your love gifts in the last weeks. You enable us to continue sharing the life transforming news of the love of God. Let me say with force– your giving is not merely dollars to support an organization. Every dollar that you send is the love of God clothed in finances and wrapped in prayer – the gift of your life joined to the Holy Spirit and sent forth to world. You and I, along with every other partner do more together than either of us could do alone in our wildest dreams. In your monthly giving you are part of my voice carrying God’s love in Christ in the power of the Spirit to the world. 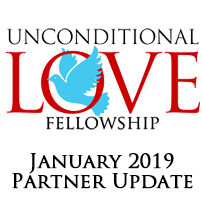 If you are on Facebook look us up at Unconditional Love LLC - and there is a lot going on there to many thousands of excited people.